Located an hour west of Atlanta, Georgia, Cedartown is just shy of the Georgia/Alabama state line. The principal city in Polk County, Cedartown features the endpoint of the 61 miles long Silver Comet Trail and a glorious view of the Blue Ridge Mountains. Incorporated on February 8, 1954, Cedartown received its name from the red cedar trees that once encompassed the city. Known to many, this city is not only full of mountain ranges and trails but, is home to Big Spring, the largest natural limestone spring in the South. The city captivates a historical presence with downtown being registered on The National Register of Historic Places due to the cities architectural design based from the 1890s. Not to mention, the popular West Cinema Theatre was built in 1941 with art deco style in mind and happens to still be in use today. Simply strolling down Main Street you’ll be able to catch a glimpse of the beauty this hidden gem of Georgia offers. What’s even better is rising above the beautiful buildings and trees and viewing Cedartown from an aerial stance. Skydive Georgia offers skydiving escapades over the mountainous region of North Georgia. With customer service representatives available 24 hours a day/ 7 days a week you’ll receive the prompt and friendly assistance needed to plan your skydiving adventure. Enjoy a glorious view of the Blue Ridge mountain range that is an astonishing 1 billion years old and is among one of the oldest mountain ranges in the United States. Known for its rugged appearance and scenic beauty, it is part of a vast system that connects to the Appalachian mountains. Imagine an overview of Georgia from 14,000 feet in the air as you prepare to rush down at speeds over 100 mph. You have the possibility of seeing many landmarks such as Lake Blue Ridge, The Chattahoochee River, Vogel State Park, and Anna Ruby Falls. You’ve never seen the beauty of nature in this way before. Experiencing a surreal adrenaline rush, you’ll be overcome with an insurmountable amount of excitement and thrill. So, what are you waiting for? The time is now, pick up the phone and give us a call to begin your skydive adventure today! Step outside of the box and break down those barriers to experience a side of life you didn’t even know existed. 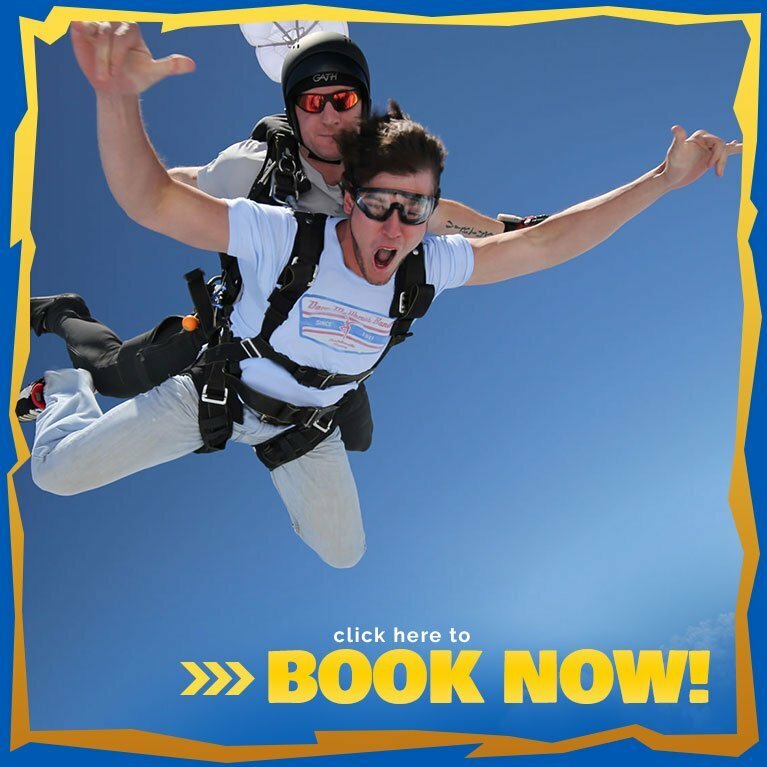 The evidence is irrefutable, whether you’re skydiving solo or with a group, we have something to offer you. Not many can say they’ve free-fallen from thousands of feet above the ground and consumed the cool, crisp air of the mountains. Don’t miss out on your opportunity to be among the few to experience a life-changing event. Let’s get ready to skydive!